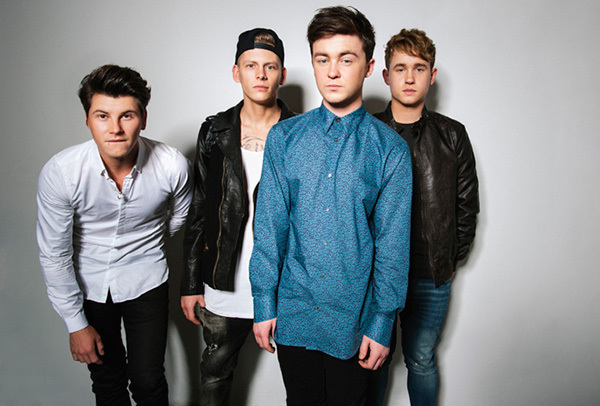 5 Qs With - Rixton - Pop! Bang! Boom! Okay, I’ll say it: I have a crush on Rixton. I mean, look at them. COME ON. How can you not? Four British guys with accents that fool around and play pop songs all day? I don’t know if that’s your idea of the ideal man (men), but it’s pretty close to mine. The foursome’s single “Me and My Broken Heart” is doing exceptionally well on the Hot 100 (it peaked at #14 and went gold), and it’s only their first official one! Boy bands are certainly back in the spotlight, and while some would argue they aren’t a boy band, they fit into that group and many of their fans are the types you’d expect to see at a One Direction show (certainly not me…). I have been listening to their four song EP on repeat, I had the pleasure of seeing them just a week or so ago, and I’m trying to spread the word. I’m enjoying this resurgence of the boys in pop, and I hope you are too. All four members of Rixton answered some question for P!B!B!, and things just got a lot cuter up in here because of it. Where did the idea to start Rixton come from? And, where’d you get the name? “Make Out” is an awesome parody of everyone from Miley to Gaga to Robin Thicke. Have you heard from any of the artists you make fun of? “Me and My Broken Heart” is such a fun song, and a home run right out of the gate. How did you come to work with such big names like Rob Thomas and Benny Blanco on your first official single? Your ‘Me and My Broken Heart’ EP is now out in the US! If your EP were a movie soundtrack, which film would you pick? Tell us about touring the US and what you're looking forward to seeing/doing while on the road. What are some artists/bands/songs/albums you’re listening to now that we should check out?